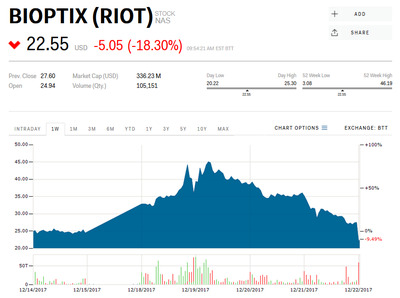 Riot Blockchain is searching for a chief technology officer a couple months after it announced it would enter the crypto market. Originally, it made diagnostic machinery for biotech companies under the name BiOptix Diagnostics. Its stock has soared more than 300% since announcing the pivot. It looks like Riot Blockchain put the horse before the carriage. The company, which pivoted to blockchain after operating for more than a decade as a biotech firm under the name BiOptix Diagnostics, is on the hunt for a chief technology officer, according to a job posting on LinkedIn. “Riot Blockchain is seeking a technically experienced and highly motivated CTO candidate with a passion for blockchain technology,” the ad said. The CTO will also help build out the firm’s crypto-mining operations. Still, a technical background in cryptocurrencies is not required. “Technical experience in cryptocurrency or cryptocurrency mining is a big plus,” the ad said. Riot Blockchain has soared more than 300% since it announced in early October that it was pivoting toward buying cryptocurrency and blockchain businesses. It previously focused on making diagnostic machinery for the biotech companies. Pivoting to blockchain is proving to be lucrative for some otherwise unheard of companies. On Thursday, The Long Island Iced Tea Corporation announced it was changing its name to Long Blockchain. Gaming company Veltyco saw its stock price leap higher on Thursday after telling investors it has “commenced discussions with blockchain and cryptocurrency providers” about potential partnerships. The growing trend is reminding some people of the dot-com bubble of the late 1990’s.